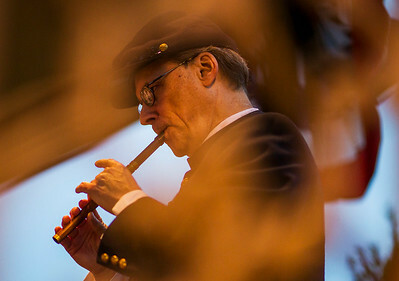 Kyle Grillot - kgrillot@shawmedia.com Composer Michael Sweeney, of Milwaukee, warms up on the tin whistle in between songs during the Woodstock City Band performance celebrating it's 130th year of existence. 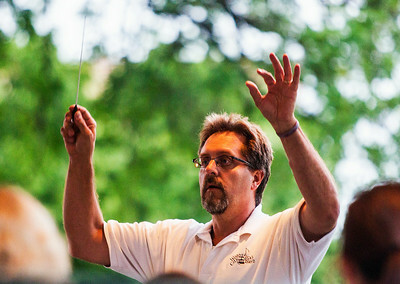 Sweeney composed and directed “Spring City Overture,” an overture written in part like a march, to commemorate the band’s longstanding history. The McHenry County Community Foundation awarded $4000 to the city of Woodstock to commission Sweeney's composure. Kyle Grillot - kgrillot@shawmedia.com Scott Hettinga of Woodstock performs the debut of an original piece during the Woodstock City Band performance celebrating it's 130th year of existence. 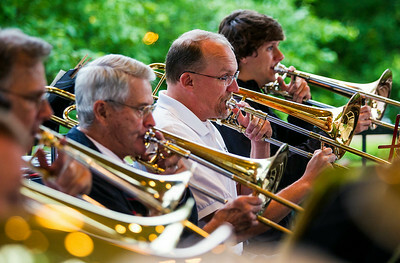 Michael Sweeney composed and directed “Spring City Overture,” an overture written in part like a march, to commemorate the band’s longstanding history. The McHenry County Community Foundation awarded $4000 to the city of Woodstock to commission Sweeney's composure. Kyle Grillot - kgrillot@shawmedia.com Brass players perform the debut of an original piece during the Woodstock City Band performance celebrating it's 130th year of existence. Michael Sweeney composed and directed “Spring City Overture,” an overture written in part like a march, to commemorate the band’s longstanding history. The McHenry County Community Foundation awarded $4000 to the city of Woodstock to commission Sweeney's composure. Kyle Grillot - kgrillot@shawmedia.com Conductor Duane Peiffer directs the band in the debut of an original piece during the Woodstock City Band performance celebrating it's 130th year of existence. Michael Sweeney composed and directed “Spring City Overture,” an overture written in part like a march, to commemorate the band’s longstanding history. The McHenry County Community Foundation awarded $4000 to the city of Woodstock to commission Sweeney's composure. 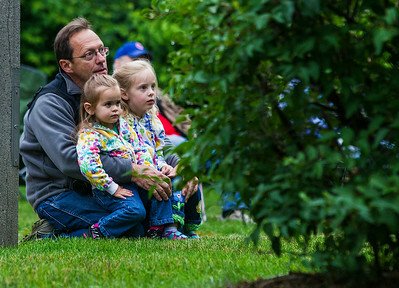 Kyle Grillot - kgrillot@shawmedia.com Rick Buechler holds his granddaughters Violet Levato, 2, and Lilly Levato, 4, during the Woodstock City Band's debut performance celebrating it's 130th year of existence. Michael Sweeney composed and directed “Spring City Overture,” an overture written in part like a march, to commemorate the band’s longstanding history. The McHenry County Community Foundation awarded $4000 to the city of Woodstock to commission Sweeney's composure. 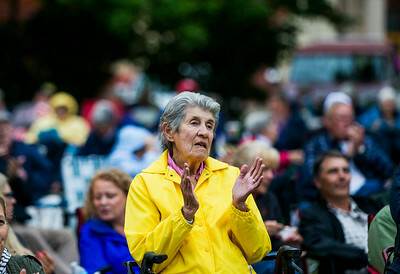 Kyle Grillot - kgrillot@shawmedia.com Luise Tipps of Crystal Lake cheers on her sons Gary and Greg Tipps while the play with the Woodstock City Band's debut performance celebrating it's 130th year of existence. 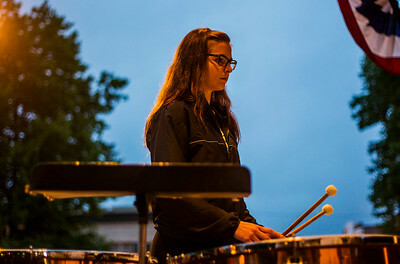 Michael Sweeney composed and directed “Spring City Overture,” an overture written in part like a march, to commemorate the band’s longstanding history. The McHenry County Community Foundation awarded $4000 to the city of Woodstock to commission Sweeney's composure. 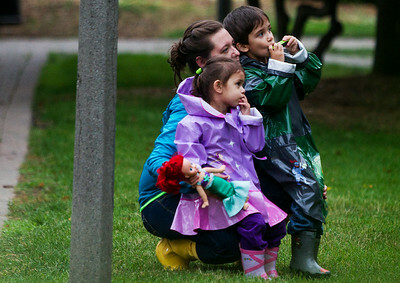 Kyle Grillot - kgrillot@shawmedia.com Heather Nicolas of Lake in the Hills holds her children Noella, 3, and Logan, 5, during the Woodstock City Band's debut performance celebrating it's 130th year of existence. 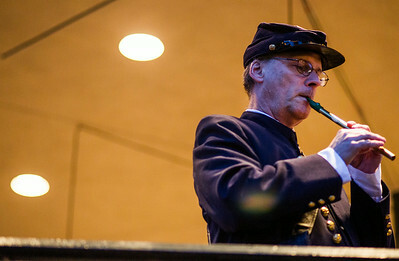 Michael Sweeney composed and directed “Spring City Overture,” an overture written in part like a march, to commemorate the band’s longstanding history. The McHenry County Community Foundation awarded $4000 to the city of Woodstock to commission Sweeney's composure. Kyle Grillot - kgrillot@shawmedia.com Lou Ness smiles as Mayor Brian Sager awards her for her completion of an approximately 750-mile trek to the capitol to raise awareness for issuers relating to poverty, in between songs during the Woodstock City Band performance celebrating it's 130th year of existence. 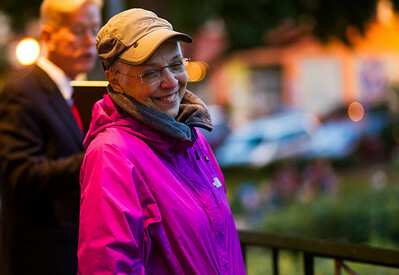 Sweeney composed and directed “Spring City Overture,” an overture written in part like a march, to commemorate the band’s longstanding history. The McHenry County Community Foundation awarded $4000 to the city of Woodstock to commission Sweeney's composure. 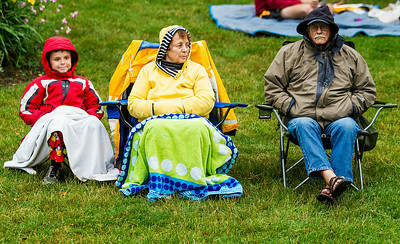 Kyle Grillot - kgrillot@shawmedia.com Jack Brown, 10, of Woodstock (from left) sits with his grandparents Joan, and Jack Brown during the Woodstock City Band performance celebrating it's 130th year of existence. Sweeney composed and directed “Spring City Overture,” an overture written in part like a march, to commemorate the band’s longstanding history. The McHenry County Community Foundation awarded $4000 to the city of Woodstock to commission Sweeney's composure. Kyle Grillot - kgrillot@shawmedia.com Composer Michael Sweeney, of Milwaukee, performs a solo on the tin whistle during the Woodstock City Band performance celebrating it's 130th year of existence. Sweeney composed and directed “Spring City Overture,” an overture written in part like a march, to commemorate the band’s longstanding history. The McHenry County Community Foundation awarded $4000 to the city of Woodstock to commission Sweeney's composure. Kyle Grillot - kgrillot@shawmedia.com Heather Keenan holds onto her 9-month-old son, Noah, during the Woodstock City Band performance celebrating it's 130th year of existence. Conductor Duane Peiffer directs the band in the debut of an original piece during the Woodstock City Band performance celebrating it's 130th year of existence. 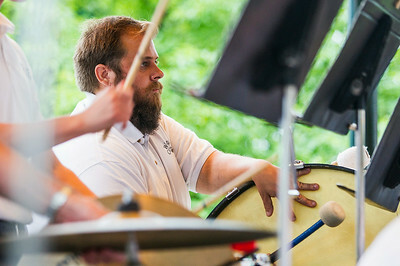 Michael Sweeney composed and directed “Spring City Overture,” an overture written in part like a march, to commemorate the band’s longstanding history. The McHenry County Community Foundation awarded $4000 to the city of Woodstock to commission Sweeney's composure.